If you are into digital marketing, you must have surely come across the phrase – “Money is on the list”. This list is nothing but your email list. You might be bored of hearing this repeatedly, but your email list can truly be your most powerful weapon for success in the digital marketing world. You can use this list to talk to your prospective clients directly in their inbox and let them know what’s happening. Whether its a sale, a discount code or a new stock, your clients get to know every little detail right when it’s happening. 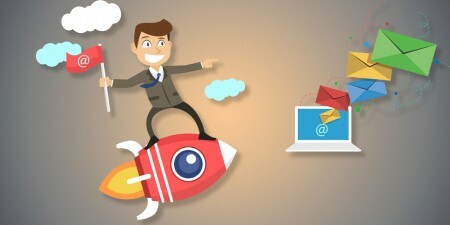 The best way to have a well planned and well-strategized email marketing campaign in your WordPress site is to have a powerful plugin that makes things easier and simpler for you. All you need to do is install the plugin on your website and activate it to get things started. You can then go ahead and use all its amazing features to create the best form to convert your leads. This needs no professional knowledge at all. It’s super easy and these plugins are highly flexible, super responsive and aggressively result oriented. In today’s post, we will talk about one of the most amazing plugins that can help you convert your visitors into followers without putting in too much effort. 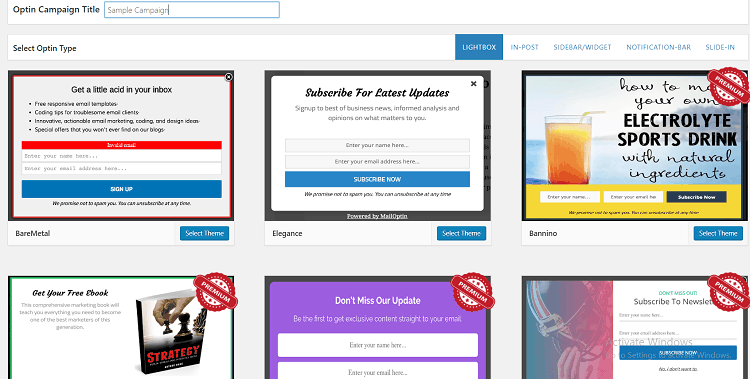 MailOptin is a powerful, flexible and responsive email marketing plugin that helps you convert your visitors into subscribers. With this plugin by your side, you no longer have to rely on any other digital marketing techniques to attract, convert or retain your customers. The MailOptin plugin comes loaded with features that help you grow and automate your email list. From scheduling newsletters, sending automated event-triggered emails this plugin lets you do everything you need to build the most powerful email list for your business. To get the best results, you can integrate the plugin with several other reliable and popular email marketing providers as well. 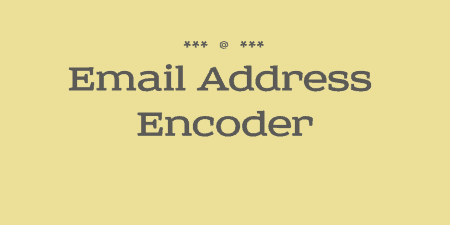 By doing so you can not only grow your email list but can also convert your leads into sales. MailOptin comes in both free and paid versions. In today’s post let’s talk about this plugin in detail and see how it can help you in your business. The best thing is, that you can do all of this right within your WordPress site. Here’s what more it has. The intuitive and powerful form builder that it tags along, makes things even easier. You can customize your forms exactly the way you want and continue using your creativity unless you come up with the perfect one. You have a huge list of options that let you change your form headings, description, add effect and more to make it appealing for your visitors. Analytics With Actionable Reporting and Insight – With this feature, measuring your growth can become way easier than you thought. It tells you exactly how your business is doing so you can take data-driven decision to increase your revenue. Exit-Intent Technology – The plugin can detect the exact moment when a user is about to exit the website. You can then display a targeted opt-in form to convert them into subscribers or display an exclusive offer. Display Effects – With this feature, you can draw your visitor’s attention right onto your form. Just choose the effects you want and click the save button. Your form will readily grab all your visitor’s attention. Display Rules Highlight – This one has a number of options. It lets you check a visitors time on your site, page views, detect ad blockers and more. 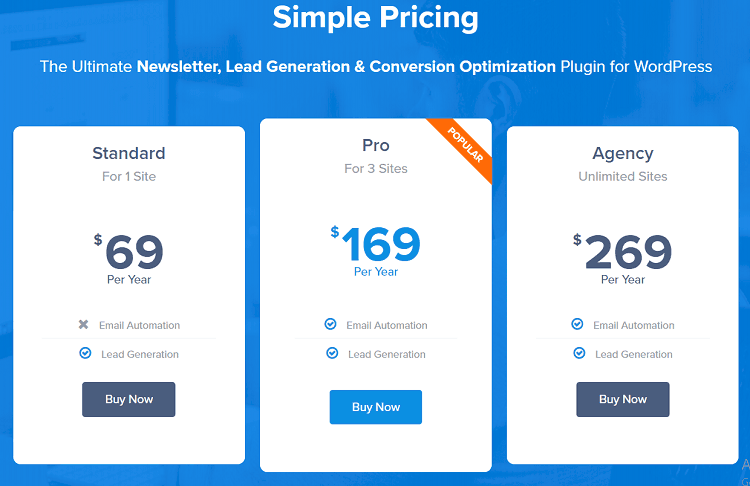 Integration – The plugin easily integrates with other reliable and popular email marketing providers such as MailChimp, Campaign Monitor, Aweber, Constant Contact, ConvertKit, Google Analytics and more. The features are not limited to the ones mentioned above. Here are some more. You might want to connect your MailOptin plugin to your marketing service if you have been using an external one. Though the process sounds intimidating it is actually a simple thing to do. After the installation and activation are done, you need to go to MailOptin>Integration. On your left side, you will see the marketing services reflecting one under another. Choose the one you have been using. The next step is to copy your Marketing Service API to complete the process. 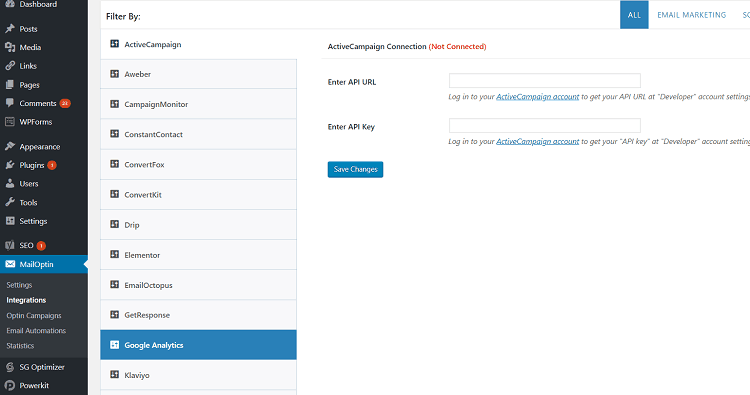 To create a campaign, go to MailOptin>Optin Campaigns>Add New. You will now have a number of beautiful pre-built forms to choose from. Pick the one you like the most. However not all the themes shown here are available in the Lite version. If you want to use the premium themes, you will have to upgrade your version. Once you are done selecting your theme, you will have a number of options to customize it. All these options will appear on the left side of your screen. Using these options you can do whatever changes you would want to see on your screen. I have used them to change the headline, add a background color, change the button text color and even changed the font size of the headline. You can use your own creativity to make it look more appealing. Here is what I have created. Under this section, you can change the way your form works. It gives you control over how it will appear for your visitors. Like for example, you can choose the time after which the form should show up once your visitor is on your site. To make t look more professional, you can remove the MailOptin branding from your forms too. If you are using a premium version, you also get to use animation effects in your forms. Under the Integration part, you can choose the marketing service that you want to connect to. Here you can also use the LeadBank Only option which lets you exclusively store your lead data in your own database. You can then access them later whenever you are in need of them. 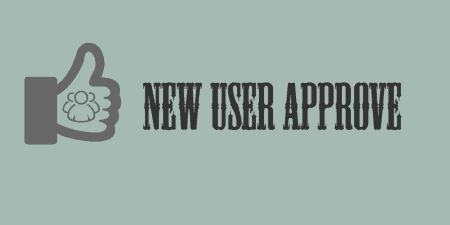 In this section, you can alter and set up changes that you want for your form once a user hits the submit button. So you can do the following here. You can also set up a message for your users that will be automatically delivered to them once they submit your form. This can be a Thank You or a Welcome message. Since I am using the Lite version, I do not get to use as many options as the premium version has. So I can just select or close the option for my form to appear on all the pages of my website. I choose to display it in all the pages. So I will keep it checked. But if you want it to appear on a selected number of pages only then you can do it too. But it is best to show it in all pages because you never know which page of your website might have a visitor. The plugin comes in three different versions. The Standard version, the Pro version, and the Agency version. The standard version is available at $69 and can be used in a single site only. But you only get to avail the lead generation option in this version. The most popular one being the Pro version which is available at just $169 per annum. You can use it on 3 different sites and can avail both Email automation and lead generation facilities. The third one is the Agency version which is available for $269 a year. This version can be used in an unlimited number of websites. A website with a great contact form can be considered to be incomplete. 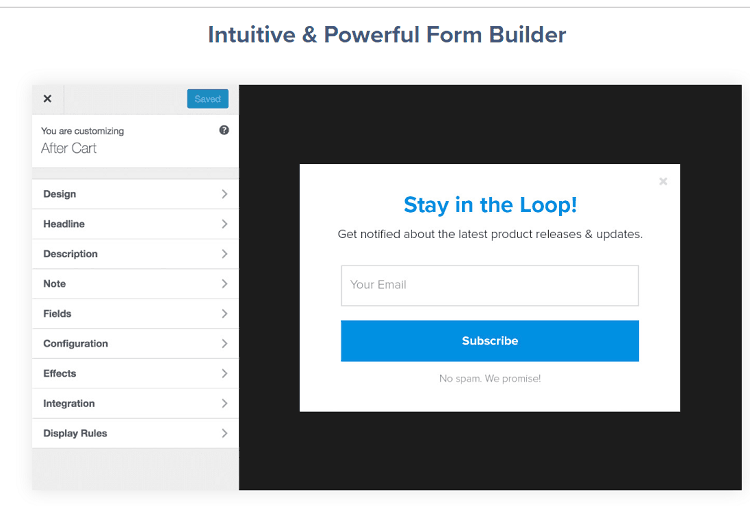 Using a Contact Form plugin can be a great way to add an amazing form to your site. And MailOptin is the perfect plugin for the process. Whether it’s for creating an email marketing campaign, sending a newsletter or adding a simple contact form to your site, MailOptin lets you do all of these in a jiffy. Best thing is you need no coding at all to come up with the most creative form for your site. So what are you waiting for? Get the plugin now.